Last month, during my immersion into the world of improv at a fabulous BATS Intensive in San Francisco, I learned about The Story Spine, a core ingredient of the improv form. The Story Spine, charted above by my teacher Lisa Rowland, is a blueprint for the dramatic structure of basic stories, whether those told in improv or elsewhere. (Incidentally, it includes all the different pieces of my favorite change model, that of Virginia Satir, which one of these days I’ll find time to write about). 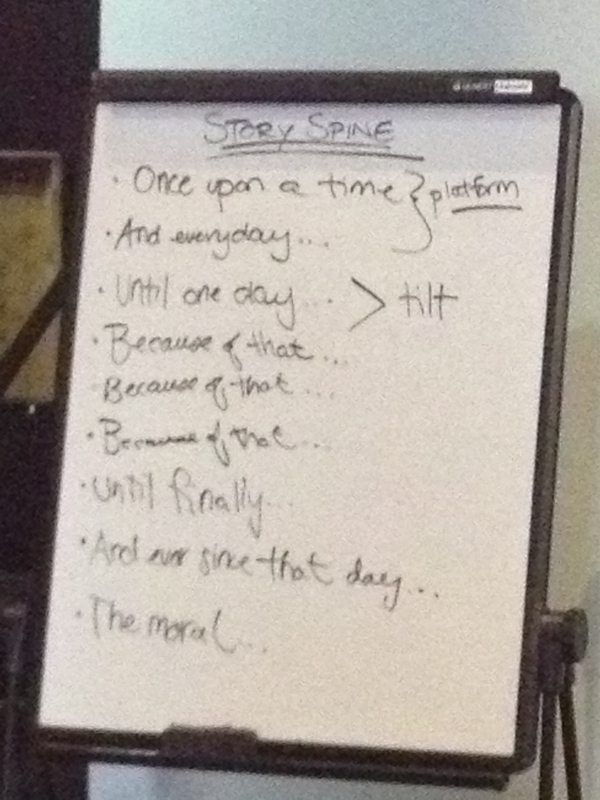 Lisa told us that the first two parts of the Story Spine—Once upon a time… and Every day…— are called the platform. Many improv beginners feel compelled to start with something dramatic or unexpected. Lisa explained that this doesn’t work because you can only generate drama when the audience has a baseline from which drama can spring. You need to establish a platform before something new—what in improv is called the tilt—happens. Beginning a scene being pelted with oranges is confusing. Waking up tired on a lumpy mattress with your longtime girlfriend Suzy, entering IKEA to shop for a new bed, and then being pelted with oranges has potential. 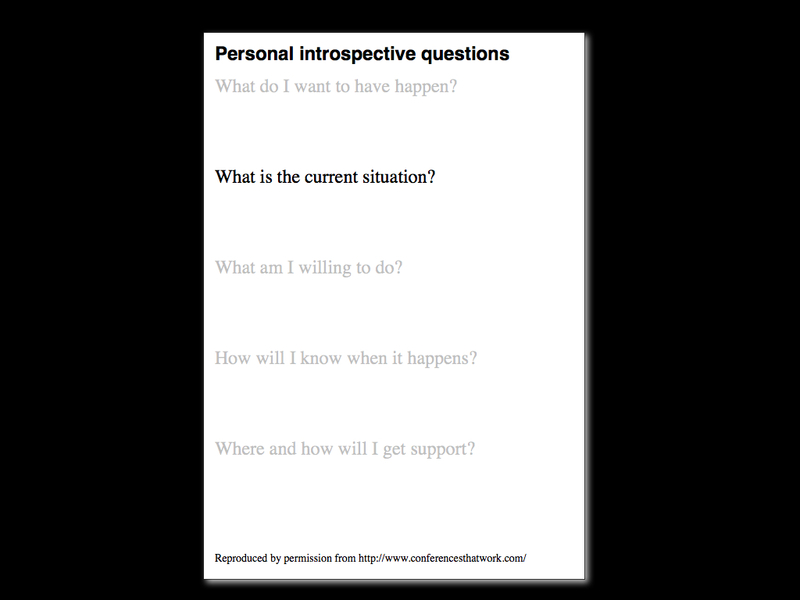 The second question on the card I use for running a closing conference personal introspective asks: What is the current situation? I used to think this question was the easiest of the five questions to answer, but now I’m not so sure. Just like in improv, it’s tempting to decide that dramatic change is needed and then rush into listing ideas for reshaping your life. The unfortunate reality is that you can’t really figure out where you want to go until you know where you currently are. I’m stuck in a job with no prospects of career advancement. Our customers are complaining about the amount of time they have to wait on hold. Being responsible for all the logistics of our events exhausts me. though these are important. It also involves noticing how you feel about these facts, because our biggest blind spots are usually those that are just too painful or embarrassing to notice. I feel angry doing the same dead-end job day after day. I feel inadequate if I can’t help every customer so they’re completely satisfied. I feel selfish if I delegate and take some downtime for myself. Working on teasing out the feelings behind the facts usually pays rich dividends. So don’t be in too much of a hurry to sink your teeth into the juicy possibilities of change in your life. Be sure to spend enough time figuring out the current situation, especially the feelings that are driving your desire for change. That will make the tilt, when it comes, all the sweeter. This entry was posted on Monday, October 8th, 2012 at 8:18 am	and is filed under Facilitating Change. You can follow any responses to this entry through the RSS 2.0 feed.You can leave a response, or trackback from your own site.